After their blip against Westmeath Dublin’s shooting was back on form. The last six games, including the league semi-final and final, have returned Conversion Rates of 61%, 67%, 74%, 64%, 39% and 66%. The average is 51%. Here the foundation was laid in the first half when they converted a whopping 82% of shots with a weighting of +6.55. All this was from play with only one shot at goal. They did something very similar to Kildare where they scored 3-10 off 19 shots (+4.28) in the first half. Such accurate bombardments are incredibly tough to resist. Fermanagh have been inundated with praise for their efforts and rightly so. Now whilst the game was not a contest, and we must factor in the fact that Dublin’s efforts waned in the second half, they more or less matched Dublin in terms of possessions and shots. 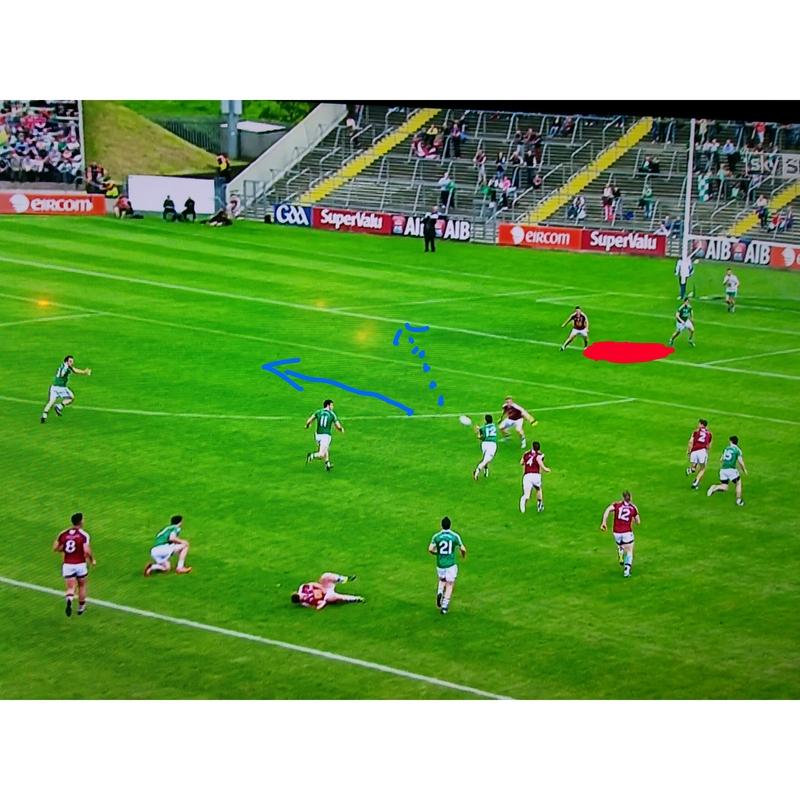 Their shooting did not match Dublin but it was not because they were poor – they were average. It was just that Dublin were, once again, stellar. Where to start. Bernard Brogan grabbed 1-06 from 9 shots getting 0 – 02 with his two left footed attempts and netting his only goal bound effort. He has been uber efficient in front of goal scoring 5-00 from the six goal attempts he’s had this year and getting 0-16 from his 24 point attempts. That’s a combined Conversion Rate of 70% with a weighting of +6.93. We are talking James O’Donoghue from last year. Dean Rock was next on the list grabbing 0-04 from 5 attempts with his only miss being a goal attempt blocked early in the second half. He scored one beauty at the top of D where he gathered a high ball, dropped and swivelled. He has still to prove himself against tougher opposition but accuracy of his level does him no harm. Plus you have to imagine his deadball proficiency will see him in the starting 15 for the semi-final. Rock continues on his merry way. Since the league semi-final against Monaghan he is converting at a hardly believable 93%; 28 from 30 including 4 from 4 on 45s. No one, in the now 4 years we have data for, comes near this level of accuracy. B Brogan had historically struggled on frees and whilst Rock’s accuracy has undoubtedly added an extra dimension to the Dublin game I do wonder if Brogan’s resurgence this year has anything to do with him not having to take frees. He looks “freer” this year than he has for the last few. Another reason to start Rock? Quigley had a very good day on frees nailing two outside the 45 in the second half; his only miss was in the 69th minute from the right – the “wrong” side for a right footed kicker. 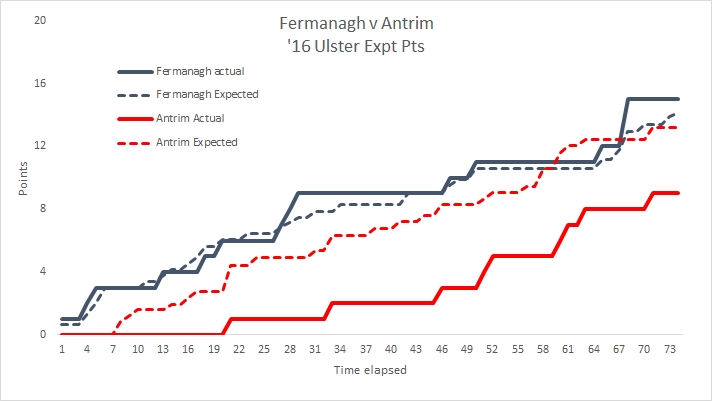 Perhaps the biggest surprise of the day was how well Fermanagh fared on kickouts. We all know Dublin’s providence in this area but the last day Fermanagh, on kickouts that travelled past the 45, lost the battle 8 – 6. Here nine of their kickouts went short yielding 0 – 03 whilst they won 65% (17 of 26) of those that travelled past the 45. 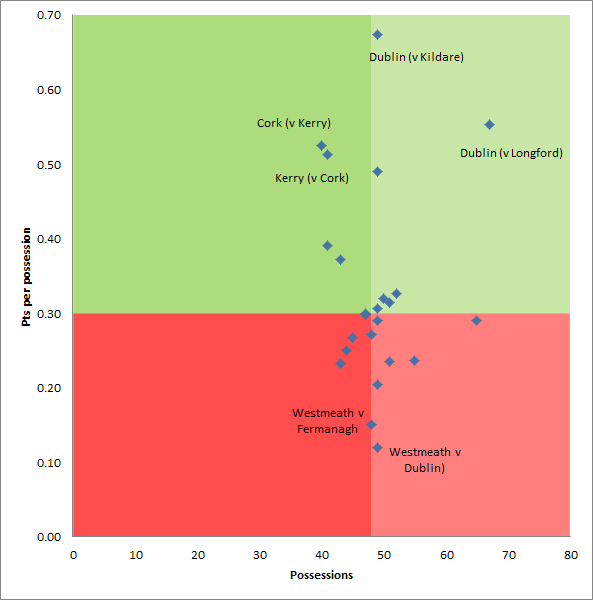 Winning possession on 74% of your own kickouts is very acceptable – Westmeath managed 61% whilst Longford were at 44%. 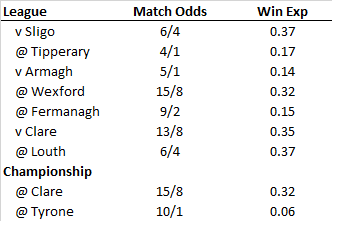 Again on Dublin contestable kickouts Fermanagh were fine winning 5 of the 10. The problem was that Dublin went short on 63% of their kickouts and scored an incredible 1-10 from those 17 kickouts. To put that in some perspective they score 0.76 points from the 17 possessions that emanated from short kickouts; they scored 0.38 points from all other possessions. A tidier game from Dublin after the 31 turnovers conceded against Westmeath. The last day the main culprit was MacAuley – here it was, surprisingly, Paul Flynn. I have him tagged for 5 turnovers with 3 of those passes going astray. As ever highlighting one player can be misleading, as we are only listing the negative plays, still it was by no means his finest day at the office. In fairness the returns show that he was more than capable of taking those shots – but it is still some sequence! That’s just a nasty set of numbers all around. Watching the game it never felt that Fermanagh were in it yet they had the ball inside the opposition’s 45m as many times as Down did. They also had the same (poor) shooting accuracy as Down – they just didn’t pull the trigger enough. Previously I had noted that Antrim had a very deliberate ploy of playing defensively whilst hitting shots from the 45m line as a way of compensating for the lack of bodies up front. Fermanagh were every bit as defensive (yes they were down to 14 men but the sense from watching the game was that nothing really changed re their alignment with the red card), and their shooting was every bit as poor, but I don’t think the lack of return here can be placed on any obvious system calling for Fermanagh to take on difficult shots. They just shot very poorly from play. I’m sure Down were just delighted to get over a game seen by many beforehand as a potential banana skin. There were, however, worrying signs in their shooting – especially from deadballs. They *did* have a wide range of shooters but no one really stepped forward to take a hold of the shooting responsibilities. Some easy frees were missed. Against a Division 4 team this was a mediocre outing. Just a quick point on the discipline shown by both teams. Generally you will have 14 shots at goals from deadballs. Only 10 in a game shows quite a bit of discipline in the tackle.